Roll this light weight pump to wherever you need to transfer water. Ready to use out of the box and turns on with the flick of a switch. Can run for 2-3 hours pumping 3 g/min or180 g/hr with solar. Recharge the battery with solar by exposing the panel to bright sun for 3-4 hours, or plug the pump into an electrical outlet for approx. 30 minutes. 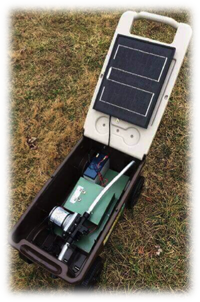 Many uses for gardeners, farmers, homesteaders, and flood cleanup: on or off-grid. The Lil Sprout comes fully assembled and needs no further assembly. Take the Lil Sprout outside to the location normally close-by the water source but it can be anywhere. Connect garden hoses to the input (female connector) and output (male connector) and connect the alternate end of the input hose to the water source. If a rain barrel, connect garden hose to the rain barrel output and open the faucet connector to allow water to exit from the rain barrel. If a pond simply place the open of the hose into the pond. (The Lil Sprout is self- priming). If the water is muddy simply use a strainer or wrap the end of the hose in small screen that is used for clothes dryers. Hold the alternate end of the output hose, or connect to a sprinkler. The Lil Sprout will now operate simply by flicking either one of the two toggle switches that are on the center panel. The DC switch is a two position switch, it simply is an “off” and “on” pump switch. In this mode the battery always being recharged by the solar panel. The AC switch center position is the “off” position. Flicking the switch toward the battery when the AC is plugged-in is the battery charging position; toward the AC plug is the pump operating position. The Lil Sprout can be plugged in any 120 V AC outlet at any time and will operate indefinitely or with the flick of a switch the battery can be recharged.